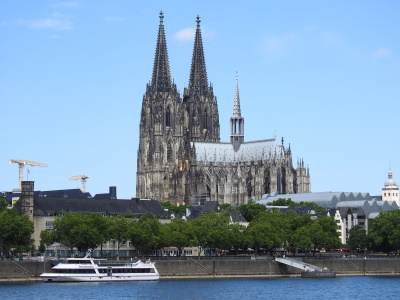 The Cologne Cathedral is the highest expression of the Gothic Cathedral architectonic form that developed over the 12th and 13th centuries in Europe. Already in 1248, the construction of the Cathedral was started. Until 1560 the work on this Gothic Cathedral was in progress, but an accumulation of problems prevented it to be finished. Only during the 19th century the Cathedral was finally completed, stimulated by Emperor William I. Not anymore as a pure construction to honor God, but also as a national Prussian symbol. The most striking points of this cathedral are its sheer size and the space it takes in the center of Cologne: you literally cannot avoid it. The wonderfully decorated windows add some color to the otherwise gray cathedral. But that impression can be somewhat influenced by the dreadful weather I experienced there. This is a stunning site - not just for the scale but for all the detail inside. One of the first things that hits you about Cologne Cathedral is its location. It's literally right outside the main train station and it's the first thing you see when you arrive by train. I stayed in Cologne for a few days and used it as a base to see a few other WHS, but it's worth noting that you could see the cathedral on your way somewhere else because of the ease of access from the station. It's possible to climb one of the spires and I highly recommend doing that. It's not just for the view (which is great) but you get to see some of the architecture close up and get a sense of the scale of this building. Inside the cathedral, there is so much to see. I walked around and saw it independently but, in hindsight, I wish I had done some kind of guided tour to learn about everything that there is. Visiting for the first time in January 2015, and then again in August, I was pleased to see the High Gothic enormity of the Cathedral with my own eyes. It survived repeated Allied aerial bombardments of the city in the Second World War, including the RAF’s first ‘thousand bomber raid’, making it the German counterpart of St Paul’s in London, which miraculously escaped the Blitz. I enjoyed looking at the Shrine of the Three Kings, whereas the Crucifix of Archbishop Gero has less of a 'wow factor', despite being just as significant (possibly more). The façade of the cathedral is the largest of any church in the world, and intricately detailed. It is inscribed as a WHS because it is a testament to the ‘enduring strength of European Christianity”. This is demonstrated by the fact that over its six century gestation period, generations of builders stayed true to its original design. I have visited the cathedral of Cologne many, many times and I have strong emotional ties to it. However, if I look at it from a neutral point of view, I must admit that I have seen many religious buildings that are far more beautiful and that I admired much more. As previous posters have already written: It is very dark both from the outside and when you are inside, it is more impressive than beautiful, and most of the time it is far too busy and crowded. It is probably something you should have seen when you travel to this part of Germany, but you shouldn't expect too much. The sheer size of it is totally breathtaking and inside you feel so small, but being there among countless other tourists, it is hard to have a spiritual experience. However, the cathedral of Cologne is much more than just a cathedral: It is the symbol of Cologne and the favourite building and icon of the city and its people. As a popular carnival song says (in my translation): "We let the cathedral stay in Cologne because that is where it belongs - what should it do elsewhere, that wouldn't make any sense!" piece of the Koln Cathedral, they obtained it when a fund raising scheme was being organised to raise funds for the massive restoration work at the Dom. This was in the 1980's, we still have it at our HQ to this day. A visit of the Cologne Cathedral leaves me with mixed feelings. The Cathedral impresses with its enormous size and the pure Gothic style, although it took more than 600 years to complete the building. I agree with other reviewers: the outside is dark, the surrounding square is ugly and crowded, the interior is rather plain and too crowded and very noisy. In most cases when visiting a cathedral, I get a peaceful and reverent feeling, though I'm not religious. But in the Cologne Cathedral I never get such emotions. So, what are the positive points? First, the western portal with its figural decoration. Second, the treasury. In general that's not my favourite type of artwork, but in Cologne, the treasury is impressive. Third, the view at night from the opposite bank of the Rhine. The huge size of the cathedral is even more evident. And finally, the entrance to the tower. In 2009, a new entrance from the outside was built in order to avoid long queues inside the cathedral. First, the entrance leads downstairs through a tunnel in the outer wall. I would not recommend to climb the tower, but you should have a look at these massive foundations (photo). The cathedral was completed in 1880, however, since then it is permanently in repair and renovation. No doubt this is a good thing. For centuries they say in Cologne: If the Cathedral is finished, the end of the world is coming. I visited this WHS several times. 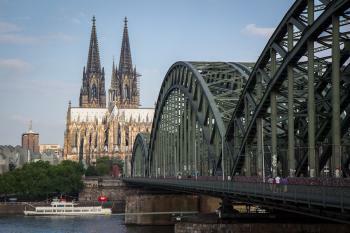 The Cologne Cathedral can be seen from any part of the city but the best viewpoint is on the other side of the river, beneath the bridge. The Cologne Cathedral has a special place in my family. My late father, Guenter Schmitz, was one of the resident sculptors in the early and mid 1950's responsible for restoration work after the war. The most prominent of his work is the masonry of the big window between the two spires above the entrance. We emigrated to South Africa in 1967. Even if my father was not involved with the Cathedral, I am very glad to see that it has been declared as world heritage site. 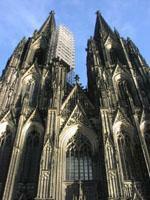 I visited the Cologne Cathedral,in July of 2002. This church left such an amazing impression on me, and does to this day. I think it shoud be one of the wonders of the world. To start to build something of this size back in the 12th century with no machinery (as we kndow today) is very fascinating. I would like to return one day, God willing,and spend more time taking in all its wonders. Cologne Cathedral is a gigantic brooding monolith. The reason why it is so dark is not due to a lack of maintenance (few cathedrals spend as much time with scaffolding as does this one), but because it is made of porous sandstone... a soft rock that unfortunately absorbs air impurities rather easily. Most of France's famous cathedrals are made of Limestone, which is better protected from weathering. Besides being on such a massive scale, the true glories of the Cathedral are its' stained glass windows, and above all its' treasures. The most famous is of course the Shrine of the 3 Magi. But the 1000 year old monumental Gero Cross is worth a visit, as are the cathedrals many items in the treasury. Cathedrals are measured by floorspace... so yes Seville and Milan have more of that. But the 150 ft. high vaults and 515 ft. tall twin towers, more than make up for that. In sheer mass, Cologne is second only to St. Peters in Rome. I have lived in Europe (the Netherlands) for the last 13 years. 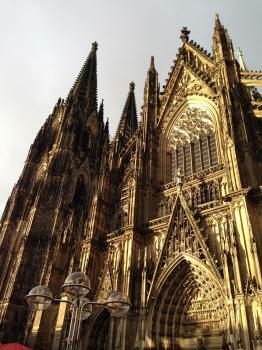 For me the Cathedral in Köln is the main attraction that has grasped my attention in the whole of Europe. I enjoyed going there whenever I have the possibility even for a week-end just to enjoy the atmosphere in that beautiful historical city and at the same time enjoy a refreshing Kölsch in my favorite place (Sion) with very tasty sausage! I have made sure that all my visitors and friends visit that city! I love Cologne and wish one day have it as my home town! Yes the crowds were there, including group of school children on class trip climbing the 517 steps to the top of the tower. If you are not fit, not worth the trip as the city itself does not offer much to see. That is not to take away from the spetacular stained glass windows, the fantastic mosaic in the ambulatory and the overall grandeur of one of the best Gothic cathedrals I have seen. The cathedral didn't look very impressive from the outside and I wondered why it was a WHS, until I stepped inside. The dome is incredible and the golden detailed painting on the roofs were beautiful. The very high stained glass windows are very nice too. If you're in the neighbouhood it's definitely worth taking a peek at. As said in many of the other entries the most striking thing about the cathedral is it’s size, it dominates the centre of the city, it is also Germany’s largest cathedral. The exterior of the building is perhaps the finest part, it is Gothic to the very core and everything points upwards, the massive towers were the largest building in Europe until the completion of the Eiffel tower. It also took a long time to complete the building, it was started in 1248 and only completed in 1880, 638 years altogether which is pretty impressive! The interior is again very Gothic everything making you look up! The stained glass windows are very fine as well, it also contains the Shrine of the Three Magi, containing the remains of the three wise men. There are a lot of down points to this site though, it was very busy inside, partly because it was free to enter, and this detracts from the feeling that this is a place of worship. The area around the cathedral is also cluttered and untidy, whilst having it share a square with the station is good for your legs, it means that the ugly façade of the station crowds the cathedral surrounds. I was also very under whelmed by Köln on the whole, it had a few nice buildings, but on the whole it left me a little indifferent. However I was quite hung over and didn’t get to sample the apparently impressive local beers! Well ... Cologne and its Cathedral. I'm living in a small town close to Cologne, around a 30 minutes drive away and so I go there quite often for shopping, clubbing or for meeting my penpals who usually visit Cologne and/or Berlin when they're in Germany. The cathedral is amazing and you actually can't miss it as it's "just there". A guided tour is always a plus when you're there, 'cause then you at least forget about people who don't pay respect to a religious building. I'm Catholic, but not religious and don't care much about the Pope and the Roman Catholic Church, but I think that we shall pay respect to religious buildings as many people are religious and their feelings shouldn't be hurt. Well, let me go on with the cathedral: if you're there you also should climb up the many steps to the cathedrals "tower" from where you have a great view over the town. 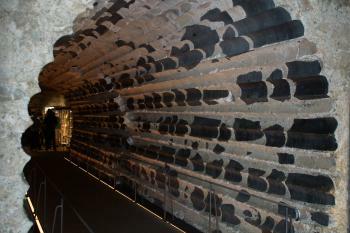 Also the treasure chambery with the coffin of the "3 Holy Kings" and many interesting religious items should be visited. Besides the cathedral Cologne has to offer much more, like interesting museums (including a chocolate museum), many other worth-to-be-seen churches and a few Roman remains as well as cultural experiences like the famous carnival (in February) and Europe's biggest GayPride Parade (= Christopher Street Day, in July). Also, when we were there (2004), the road immediately next to the cathedral was under construction. I mean, right next to the cathedral! It looked like Tyranosaurus rex was eating the old concrete overpass. And they were swinging a heavy metal ball against the bridge supports to knock them over. I can only assume they protected the cathedral in some way from the vibrations of the heavy equipment. 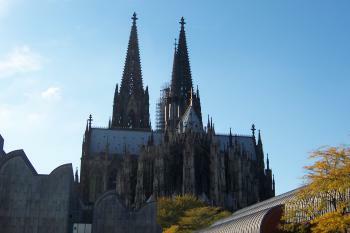 This is the most famous church in Germany and one of the most recognizable in the world. It stands out for two things especially - its huge, enormous, monstrous size (the third tallest church in the world; for a few years in the 19th century it was the tallest building on the planet) and the time it took to finish it (almost six and a half centuries). As impressive (and I mean, really impressive) as it is from the outside, as ordinary it is on the inside. It's beautiful, yes, but nothing that compares to most churches in Italy or even France. The Shrine of the Three Kings is the largest reliquary in the Western World and very impressive with all its gold, and is the one thing that should not be missed when you venture inside. I recently visited the Cathedral on January 9th this year after 13 years of not seeing it at all, and it impressed me much more than when I was living in Cologne in 1990. It might be just because this time I took myself the time to look at it properly and listen to the guide's explanations, but it really moved me. I also went there out of curiosity for the three kings story, and that impressed me too. So I must accept that besides the cold, the Dom has overwhelmed me tremendously.However, please choose a sunny day to enjoy its splendour at its highest peak. During our first visit, in 1970, we entered the cathedral through massive west doors, and in the north aisle saw a large dome-shaped bunker made of stone blocks. An English-speaking priest told us that guns and ammunition were stored there during the war. He said that as a warning, a bomb was dropped near the base of the north tower, resulting in minor damage. Other tourists, including our daughter, said they had been told that same tale, and that same anecdote was re-told during our second visit, a few years later. In 1991 Jim went to the cathedral office and repeated the fantasy we had been told twenty-one years earlier. The Cathedral architect was shocked to hear that yarn and showed us a book that detailed how stained-glass windows and other art would be stored for protection from possible damage. He couldn't imagine that story, but admitted that was the fable tourists might expect to hear. I am a student of World Heritage Studies in the Brandenburg University of Technology in Cottbus, Germany. The colongne cathedral is a masterpiece architectural edifice.It is so gorgeous that it instills instant fright when one finds himself in it. The bad thing however, is that so many visitors to the cathedral devoid it of that aura of religiousity that is characteristic of places of worship. It is more of a touristic site than a Christian place of worship.Visitor management and sensitization are vital aspects which need to be taken very seriously in order to make the Cathedral have, at all times, that atmosphere of solemnity that exists at such places of worship. Naser ed-Din Shah: "It was two hours' journey to the city of Cologne. .. A beautiful city appeared before my sight; it has a large, lofty, well-placed church, which they say is the first in Europe." Jewish religion and culture: "Jewish tablets Embedded in the interior wall are a pair of tablets on which are carved the provisions worked out by Archbishop Englebert II (1262-67) under which Jews were permitted to reside in Cologne"